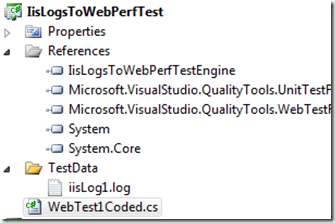 In this blog post I’ll show you how you can play back the IIS Logs in Visual Studio to automatically generate the web performance tests. You can also download the sample solution I am demo-ing in the blog post. Performance testing is as important for new websites as it is for evolving websites. If you already have your website running in production you could mine the information available in IIS logs to analyse the dense zones (most used pages) and performance test those pages rather than wasting time testing & tuning the least used pages in your application. 2. 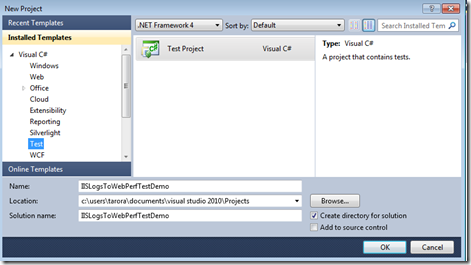 Create a new test project in Visual Studio. Let’s call it IISLogsToWebPerfTestDemo. 3. Delete the UnitTest1.cs class that gets created by default. Right click the solution and add a project of type class library, name it, IISLogsToWebPerfTestEngine. Delete the default class Program.cs that gets created with the project. 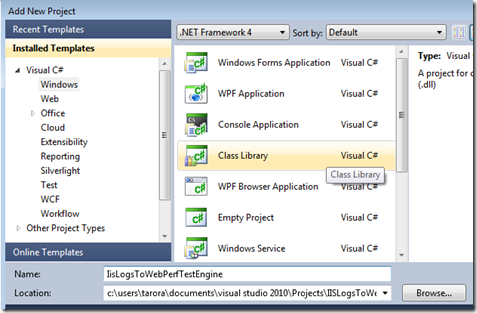 The IISLogReader class queries the iis logs using the log parser. // You could make substitutions by introducing parameterized web tests. The WebTest1Coded.cs inherits from the WebTest class. By overriding the GetRequestMethod we can inject the log files to the IISLogReader class which uses Log parser to query the log file and extract the web requests to generate the web test request which is yielded back for play back when the test is run. // lifting of reading the contents of the log file and converting them to tests. // GetRequestEnumerator Method and pass differnt log files for different tests. 7. 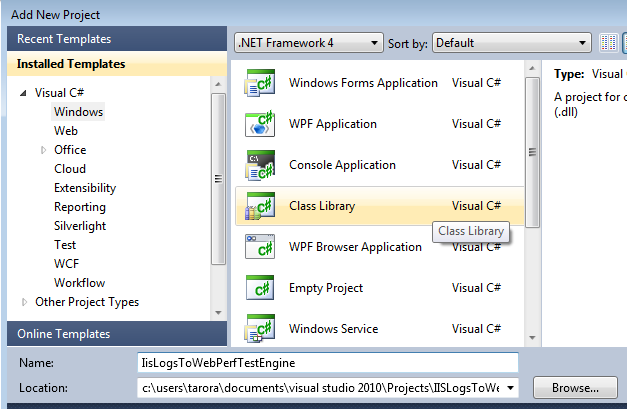 Its time to fire the test off and see the iis log playback as a web performance test. 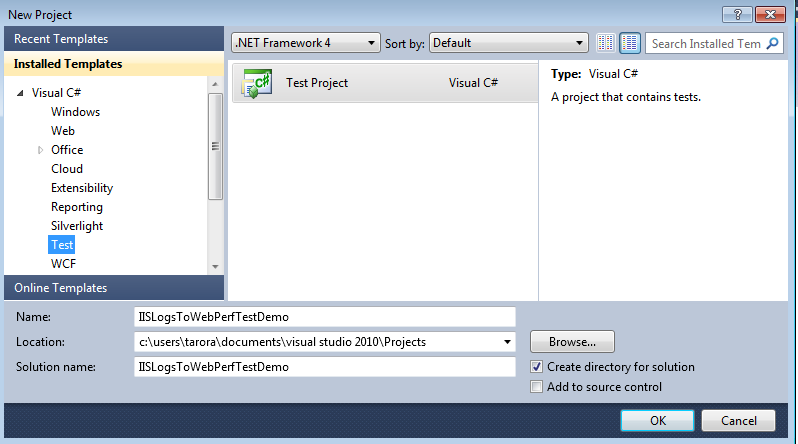 From the Test menu choose Test View Window you should be able to see the WebTest1Coded test show up. Highlight the test and press Run selection (you can also debug the test in case you face any failures during test execution). 8. 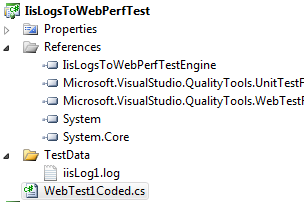 Optionally you can create a Load Test by keeping ‘WebTest1Coded’ as the base test. You have just helped your testing team, you now have become the coolest developer in your organization! Jokes apart, log parser and web performance test together allow you to save a lot of time by not having to worry about what to test or even worrying about how to record the test. If you haven’t already, download the solution from here. You can take this to the next level by using LogParser to extract the log files as part of an end of day batch to a database. See the usage trends by user this solution over a longer term and have your tests consume the web requests now stored in the database to generate the web performance tests. If you like the post, don’t forget to share … Keep RocKiNg! 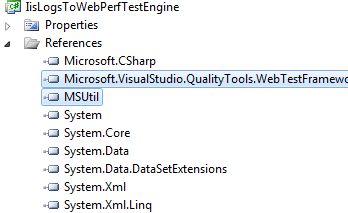 One important thing you are missing here is that if you are using VS2010 the WebTestFramework.dll is only installed with VS2010 Ultimate, not Pro or Premium. This will save anyone the effort that is interested but doesn't have ultimate. You could copy the binaries from an ultimate machine but that would only allow you to complie the project but not run it. Yes that is correct Kevin. 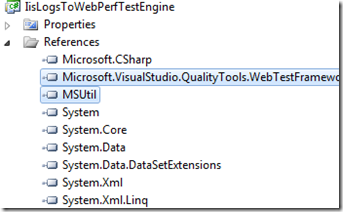 Web Performance Testing and Load testing is only supported out of Visual Studio Ultimate.